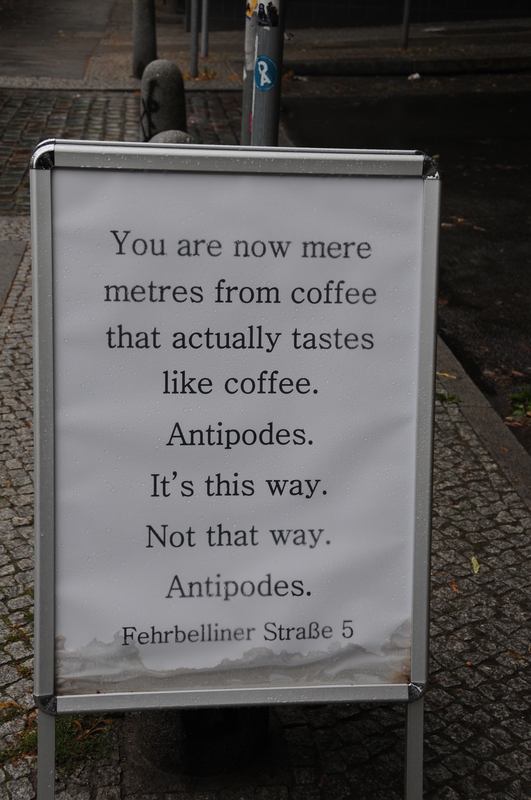 A nice invite for a coffee place in Berlin, Germany. This entry was posted in images and tagged advertisements, berlin, caffeine, coffee, drinks, food, germany, travel. Bookmark the permalink. Aha! Thanks for the invite. May be you can also come over to Bombay, and I shall return the favour. Bombay? Oh, I didn’t realize you were there, sorry for not having noticed. We lived in New Delhi for 5 years, I even took up Bharat Natyam. We came from Bangladesh through Calcutta, took the train from Calcutta to New Delhi. But we never visited Bombay. My daughter grew up in India so she loves Indian movies, so do I as a matter of fact. It seems that now Bollywood will start making movies in Europe I hope they will come to Sicily. Thank you for the invitation, but I am afraid of flying so ever since we came back to Italy from India I have not taken the plain once. I travel by bus or train…we even went to England by train once. Have a nice day!